I’m very curious about this question because it raises a couple of interesting questions about our SEO services and Google rankings. The question of whether capital letters within the Url, Title tag or Meta Description affect your search ranking in Google. 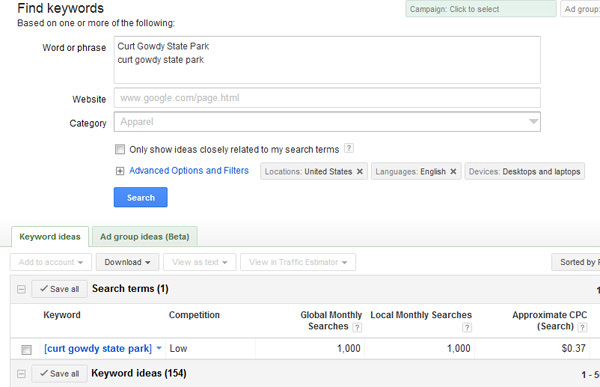 As you can see, the Google Keyword tool combined my keyword phrases into one result at the bottom. So, with regards to the Google Keyword tool, the keyword phrase is the same. For all intensive purposes I’m asking Google for the same thing but what’s with the disparity with the search results and resulting pages? After looking through all of the differences between the search rankings, I noticed that in this instance, the rankings were identical for both searches. After pouring through the search pages and trying to find any differences between the Capitalized results and Un-Capitalized results, I noticed one difference that could cause the results to be different: The URL! The only difference that I could think of that caused the disparity with the capitalized keywords and the un-capitalized keywords is the url. Take a look at the URL in the image; one has Curt Gowdy State Park Capitalized and one doesn’t. This got me thinking about how Google looks at keyword phrases for search results. Obviously for SEO, Google looks at the URL and Title tag for deciding what page gets ranked where. As you can see with the search results, people generally make the first letter in each word capitalized so that it’s easy to read, but this isn’t the case when it comes to the URL. And that’s when it clicked for me. The url doesn’t usually have keyword phrase within it. So because the Title generally will have the keyword phrase and the url sometimes won’t, that’s the disparity in the number of resulting pages. With all of this said, this leaves us SEO’ers with one question: Do Capital Letters Affect SEO? First, I think that the number of Resulting Pages (competing pages) does affect how easy it is to get a website ranked within the top 3. For instance, if there are 100 million competing pages, its going to be harder to rank for that keyword phrase compared to a keyword phrase that only has 15,000 competing pages. Because I think the previous two statements are true, if un-capitalized keyword phrases only have 15,000 competing pages and capitalized keywords have 41,000 competing pages, it should “Theoretically” be easier to rank for the un-capitalized keyword phrase. The only way to know for sure is to test this theory with similar domains and identical SEO practices. I will try to setup a controlled environment and test this and report back if there are really any differences in Google’s search results. I would like to think that there would be no difference especially because we’re searching for exactly the same thing. But it’s a question that needs answering and testing! It’s been a couple months since I last posted on the topic of Do Capital Letters Affect SEO. My previous post suggested that the SERP’s were affected by Capital letters and Un-capitalized letters within the meta info and url. 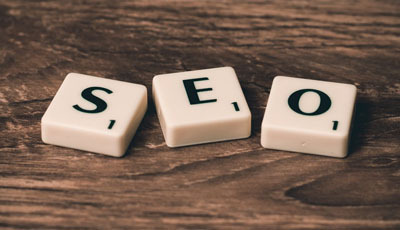 Obviously in the past couple months there has been quite a shake-up in the world of SEO and Google’s algorithms Since my last posting, I have been unable to reproduce the same results in Google using Capital letters or un-capitalized letters. I’ve tried using several proxy servers to help vary location all trying to reproduce the same results from the test. It seems as though that Google has finally fully updated their algorithm so that it’s search encapsulate’s both capitalized and non-capitalized keyword phrases. In the previous post, Google’s keyword tool combined the un-capitalized keywords and capitalized keywords, but the search showed a different resulting competing pages; thus Google considered them different keywords. Google now considers the keyword phrase the same for all methods of capitalization. The only benefit for capitalization within SERPS is for ease of readability. Typically it’s easier to read the Title if each word in the title is capitalized. Other than that, capitalization doesn’t matter any more for SEO. Good luck in your SEO search and comment below if you have any questions. I guess I should be using lower case in my title to rank my key word then? No, I think that using Camel Case is the best way to go as it provides a better user experience because its easier to read. Hey Jason, Thanks for your article and update. What do you think happens if the first word in the meta description is all upper-case? My website (all 3 pages so far, I’m converting everything to be AMP friendly) have the word “FREE” as the first word in the description. I’m frustrated. Years ago the site was always in the top three for specific searches (best example: How much aloe Vera should I drink daily?) Now it barely appears on the 2nd or 3rd page.